This is the second day of a two day open course in Ryukyu Kobujutsu, taught by Julian Mead Sensei, Chief Instructor of the RKAGB. Following the success of courses in previous years, we are very pleased to welcome him back in Bath again. This time, we have rented the gymnasium at St Mark’s School, which is much closer to main access routes to Bath and in particular the M4. It offers a large training space with changing facilities. 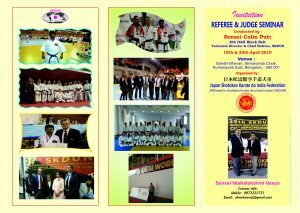 The course will cover Bo and Sai, and will be of particular interest to students of Karate, as the two arts are closely related. A strong base in Karate is very helpful, although not essential, in progressing in Ryukyu Kobujutsu. Serious training in Kobujutsu also has the effect of improving your empy hand skills. Once the initial unfamiliarity with each weapon is overcome through training, it is just the matter of moving the body to strike, deflect and evade. The weekend is aimed at giving novices and beginners the chance to receive instruction from Julian Sensei, and meet some of the other instructors and students of the RKAGB. If you have attended an RKAGB event in the past, you require an up to date RKAGB licence to attend. If it is your first time you are very welcome to come along and try us out, at no obligation. We are very much looking to reunite with see those who attended the course in October again, as well as introducing this fascinating and subtle art to some new people.